Grumman began development of a two-seat trainer version of the F9F-8 Cougar in November 1953, shortly after the single-seater went into production, under the designation Design 105. The company-funded project was intended to meet future Navy needs for a combat-capable two-seat trainer to serve alongside single-seat Cougars in fleet squadrons. Grumman believed the two-seat Cougar could also serve as a carrier-landing trainer and as a trainer to familiarize pilots with the then-new process of in-flight refueling. Originally, the 105 was to carry the same 4-cannon armament as the single-seater. The Navy’s initial response was that there was no need for the airplane, since the Lockheed T2V-1 Sea Star would fulfill all requirements for a carrier-capable trainer. However, Grumman was authorized to complete one F9F-8 airframe - BuNo 141667 - as a two seater under the designation YF9F-8T. The forward fuselage of the F9F-8 was extended 34 inches to make room for the second cockpit. The student was seated in front with the instructor in the rear under a large rearward-sliding canopy, with an auxiliary windshield provided internally ahead of the instructor's seat, thus enabling the aircraft to be flown with a partially-open canopy during a carrier landing. As the Cougar was never over-powered, two of the four cannon were removed to save weight and the ammunition supply for the two remaining was cut in half. The YF9F-8T first flew April 4, 1956. As it turned out it was good the Navy had allowed Grumman to proceed, since the T2V-1 Sea Star had many problems with its then-revolutionary boundary-layer control system. The lack of armament in the T2V-1 meant it could not be used as a weapons delivery trainer. All this led the Navy to acquire 399 production F9F-8Ts between July 1956 and February 1960. Most were fitted with a in-flight refueling probe in the nose, and late-production F9F-8Ts were equipped at the factory to carry two Sidewinder missiles under each wing, but this capability was seldom retained in service. The F9F-8T - known as the “Two-gar” - entered service with Naval Air Training Command in 1957 and eventually equipped five squadrons. Shortly after entering service, the Blue Angels adopted the F9F-8T for use as their “public relations” airplane to take reporters and local dignitaries aloft during team visits. “Navy-7" remained with the team after they transitioned to the F-11F-1 Tiger in 1961, and was used by the team until 1967. This airplane is now on display aboard the USS “Lexington” floating museum at Corpus Christi. The F9F-8T participated in the first demonstration of the Martin-Baker zero-zero ejection seat when RAF Flight Lt Sydney Hughes ejected from the aft cockpit of an F9F-8T on August 28, 1957, flying at ground level and 120 mph. F9F-8Ts were later flown by the Naval Parachute Facility at NAS El Centro for ejection seat tests, during which they flew with the rear section of the canopy removed. Grumman proposed a radar-equipped night fighter version of the F9F-8T in 1955, using an AN/APQ-50 radar with an all-missile armament. With the additional weight, performance was considered insufficient. This led Grumman in 1961to propose modernizing the F9F-8T with updated systems and a Pratt & Whitney J52 turbojet replacing the J48. The Navy chose the Douglas TA-4F instead, which closed the book on further development of the two-seat Cougar. The new Defense Department Tri-Service designation scheme led to the F9F-8T being redesignated TF-9J in 1962. The Cougar finally saw combat in 1966-67, when four TF-9Js of H&MS-13 were flown in the Forward Air Control role, directing air strikes against enemy positions in South Vietnam in support of the Third Marine Division in I Corps. The TF-9J continued in service long after the single-seaters had been sent to the boneyards. VT-4, The last squadron to use the TF-9J, finally retired its last TF-9J in February 1974. That airplane - F9F-8T BuNo 147276 - is now on display at the National Museum of USN Naval Aviation at Pensacola. This F9F-8T by Paul Fisher is the first “Two-gar” in 1/32. 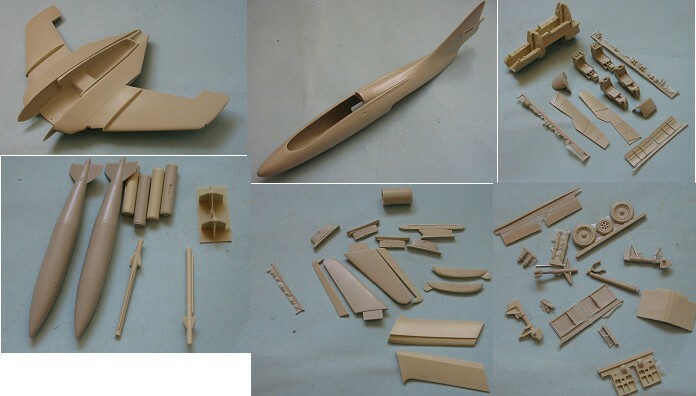 Previously, a 1/48 resin F9F-8T was released by Collectaire, while Falcon included a 1/72 vacuform conversion for use with the Hasegawa F9F-8. In terms of overall quality, this kit is the best of the three. Modelers who are familiar with the previously-released F9F-5 Panther and F9F-8 Cougar by Fisher Models know the level of quality to expect. As with those two kits, the quality of the cast resin is the best in the industry. The kit provides both the original Grumman ejection seats used before 1961, and the later Martin-Baker Mk.5 seats used through most of the 1960s. The seats a beautifully cast and include photo-etch seatbelts fully able to depict the complicated belts used on the Martin-Baker seats. The cockpit is fully detailed with a one piece floor/console thin side walls, and the rest of the various bits and pieces, with instrument panels done with film and photo-etch. 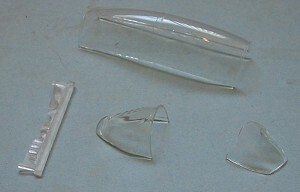 The canopy, which can be posed open or closed, is clear resin, already dip ped in Future to obtain exceptional clarity. Posing this with the canopy closed will present no problem for seeing the detail in the cockpit. 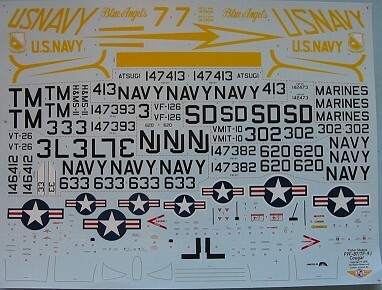 Six aircraft are on the huge decal sheet, including the Blue Angels “Navy-7,” one of the four TF-9Js flown by H&MS-13 as Fast FACs in Vietnam, two Navy and one Marine trainers in International Orange and Gloss White, and a station hack at NAS Atsugi in Gloss White and Flourescent Red-Orange that I think I saw in person once back in my Navy days. The decal sheet also includes all stencils. Designed by Jennings Heilig and printed by Eli Raphael’s Zotz Decals, it looks to be of excellent quality. I remember first seeing an F9F-8T on the cover of Air Classics when it first entered service. I thought it looked totally cool in its orange-white scheme. I ran across F9F-8Ts several times while in the Navy and they looked even better in person. I saw Navy-7 perform once at an airshow in the late 1950s in Denver and thought it looked better than the single-seaters. Thus, I am really glad that Paul Fisher has brought us this very high-quality kit of one of my favorite jets in my new favorite scale of 1/32. The kit provides sufficient detail out of the box to create a great model, while also providing those who want to add extra detail the scope to do so. The production design is so simple that a modeler would have to take pains and a lot of planning to do something wrong in assembly. Some people will have sticker-shock at a price of $195, which is an increase from the $175 charged for the previous kits. This increase is due entirely to the increased price in resin - which is a petroleum-based product (and we all know where oil prices are going). That said, it is not over-expensive for what you get in terms of quality, unlike some other limited-run kits out there. If you like U.S. Naval Aviation as a modeling subject, you will not be disappointed by what you get here - this is the kind of kit that can make an average modeler look really good with the completed model. Thanks to Paul Fisher for the review copy. Get yours at www.fishermodels.com - he’s shipping ten a day now, so someone likes it.